› Author Affiliations Funding Michelle L. Dossett was supported by K23AT009218 from the National Center for Complementary and Integrative Health (NCCIH) at the NIH. Homeopathy is used by just over 2% of the U.S. population, predominantly for respiratory, otorhinolaryngology, and musculoskeletal complaints. Individual users who see a homeopathic provider for care are more likely to perceive the therapy as helpful than those who do not; however, only 19% of users in the United States see a provider. The rest presumably rely upon over-the-counter products. Recent clinical trials highlight several areas in which homeopathy may play a role in improving public health, including infectious diseases, pain management, mental health, and cancer care. 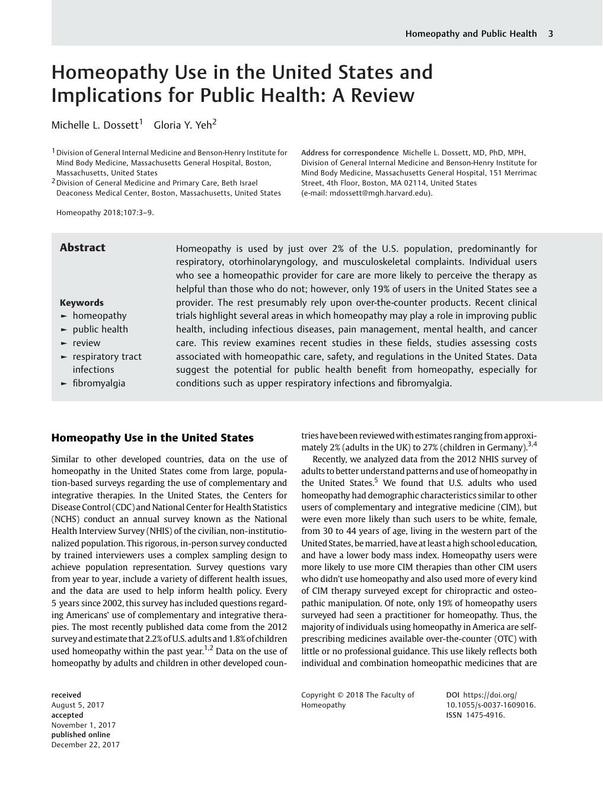 This review examines recent studies in these fields, studies assessing costs associated with homeopathic care, safety, and regulations in the United States. Data suggest the potential for public health benefit from homeopathy, especially for conditions such as upper respiratory infections and fibromyalgia. 19 Taylor JA, Jacobs J. Homeopathic ear drops as an adjunct in reducing antibiotic usage in children with acute otitis media. Glob Pediatr Health 2014; 1 DOI: 10.1177/2333794×14559395. 21 van Haselen R, Thinesse-Mallwitz M, Maidannyk V. , et al. The effectiveness and safety of a homeopathic medicinal product in pediatric upper respiratory tract infections with fever: a randomized controlled trial. Glob Pediatr Health 2016; 3 DOI: 10.1177/2333794×16654851.